Art Talk: Creative Imaginations and Faber-Castell Design Memory Craft blog hop! Creative Imaginations and Faber-Castell Design Memory Craft blog hop! Don’t forget to leave a comment on each blog for a chance to win! Creative Imaginations and Faber-Castell Design Memory Craft will each be giving away a $50 prize pack! I created a mixed media altered canvas using many of the products from both companies!! LOVE these together! 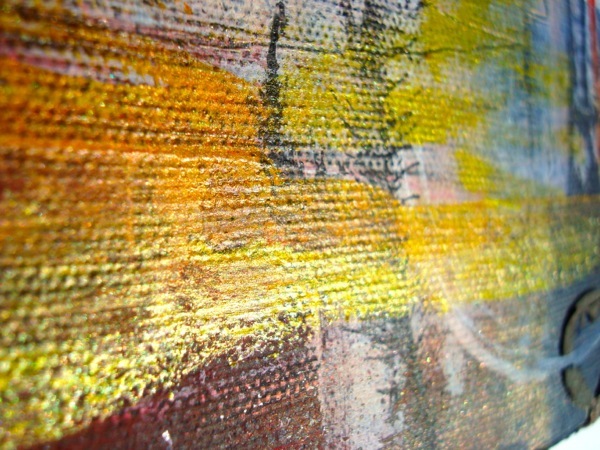 The canvas was primed with black gesso and then Gelatos were colored over the dry surface and smudged with my fingers. White gesso was then applied with an old credit card and scratched into with a sharp tool. 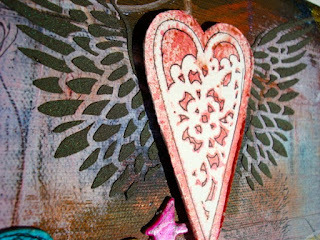 Using Twinkling H2Os I stamped with Creative Imaginations wood mounted stamp. I colored some Prima letters with Twinkling H2Os after coating them with Primary Elements Bind & Resist first to create a better adherence. 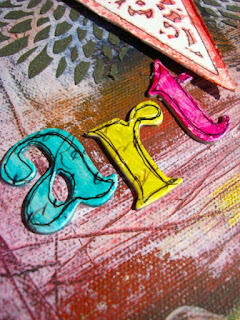 After stamping gesso on the canvas with a foam block, I dripped Twinkling H2Os down in the same colors I used on the letters. 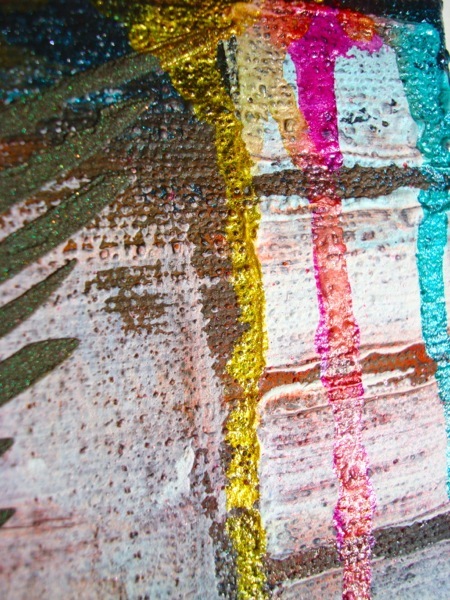 Here's a close up of the painted area using my favorite colors of the Twinkling H2Os...Lemongrass and Mandarine Citrine! 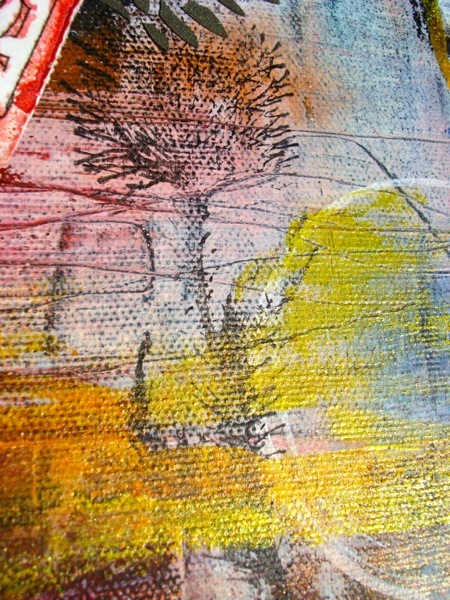 Thistle stamp using Faber Castell's PITT Big Brush Marker in Black. I also used the White Big Brush Marker to create circles! I loved the stencils from Creative Imaginations... the wings and heart were my favorites! I used Gelatos mixed with water and sprayed for the heart and then outlined it in PITT artist pen with a small tip. The wings were made with modeling paste mixed with Black Licorice Gelato and LuminArte Dragonfly Wing powder. The result is a black with sparkle that is stunning! I had a blast with this project and hope you liked it! Don't forget to leave a comment here and on all the other designer's blogs to have a chance to win the prize! Love the edgy nature and graffiti feel to this. I love doing projects like this. So very cool and fun!! Great layers and colors and textures. Love how 'art' just pops on the page! ARE YOU KIDDING ME!!??!?!? having to manually close my mouth cause this is jaw dropping gorgeous!! Very creative--I like the stencils you used. I love the depth and your choices in color and medium. I love everything and am having difficulty finding the words that I want with out sounding cliche. Right now I just want some of this product to play with. Gelatos and markers and Twinkling H2Os...oh my! Very unique. OK - TOTALLY beautiful and arty! Amazing textures and techniques! LOVE LOVE LOVE!!! Wow...this is gorgeous...love every detail! Fun and inspiring projects! Thanks for the ideas! 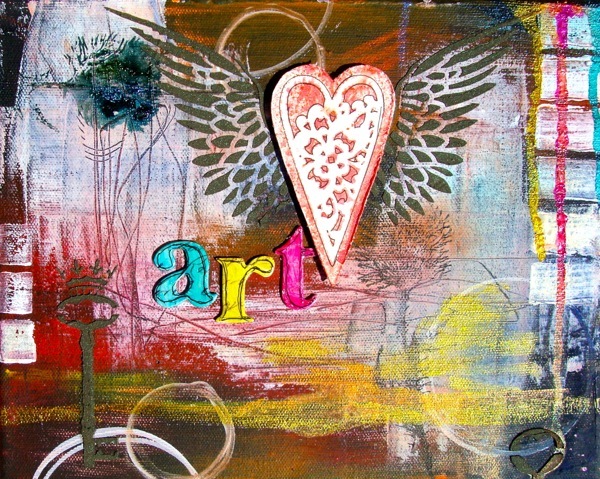 And I love the artwork you created! This blog hop is so much fun! LOVE this! I'm coming back for the blog hop! Seriously, that belongs in a museum, or at least a gallery. AMAZING! Love everything happening on the canvas. OOOOHH! This one might be my favorite yet! I love the boldness of the colors and all the texture. DROOL! Great Art canvas - love your color choices and composition! Wow! That is awesome!!! I can't wait to try mixing my gelatos with paste!!! TFS!! I love how you mixed all these products. I feel inspired to try something new ! I like the different elements in this piece. WOW, great canvas. Love all the layers on it! Looks like you had a fun time making your project with all the great products from these companies! This piece conveys how much fun you had creating it! Your creative juices really must have been flowing! I think it takes a lot of courage to follow your instincts. Fantastic job! Thant you for your inspiration. 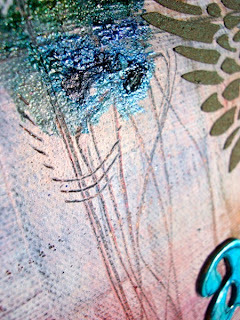 Love your color choices :) and different textures used. Really cool, love seeing the stencils used! And seeing your steps. Thanks for sharing. I can't believe how well the gelatos covered over the black gesso. The gesso also added great dimension. Good job. Very nice project! 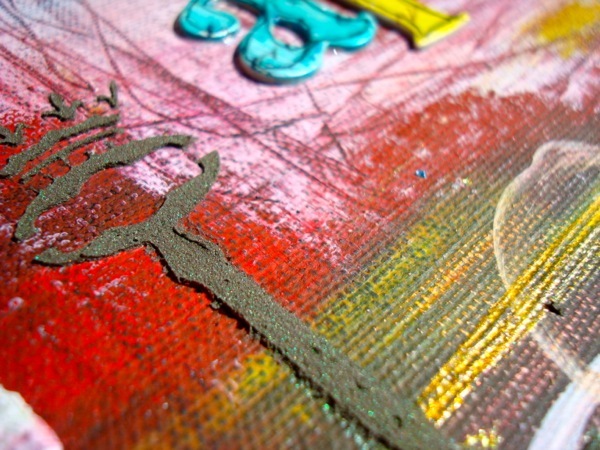 i love the colors and the mediums that you used. I love this, amazing art!!! What an amazing technique -- creating texture by peeling back to the corrugated part of the box! Love it!